Cleanse, exfoliate and hydrate skin with the NuFACE Prep-N-Glow Cloths™; triple-action, dual-sided face wipes that effortlessly remove makeup and leave skin feeling smooth and supple – perfectly prepared for your NuFACE treatment. Made from soft cotton lace, the smooth side dissolves dirt, grime and impurities, while micro-dots deliver gentle exfoliation to buff away dulling dead skin cells and stubborn makeup. 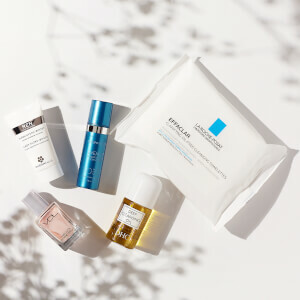 Each cloth is saturated with a blend of Hyaluronic Acid, antioxidants and minerals, which help protect and moisturize skin for a refreshed, radiant and purified complexion. Individually packaged for optimum potency. Free from oil, alcohol, parabens and sulfates. Cleanse skin with smooth side to remove makeup and impurities. Follow with gentle exfoliation using the micro-dots side. No rinse required! May be used daily or for sensitive skin, 2-3 times per week. Water, Polyglyceryl-4 Laurate/Succinate, Betaine, Phenoxyethanol, Saccharomyces/Copper Ferment, Ethylhexylglycerin, Fragrance, Glycerin, Saccharomyces/Magnesium Ferment, Saccharomyces/Zinc Ferment, Sodium Citrate, Sodium Hyaluronate, Vitis Vinifera (Grape) Seed Powder Extract, Aristotelia Chilensis (Maqui Berry) Fruit Juice, Glycyrrhiza Glabra (Licorice) Root Extract, Ginkgo Biloba Leaf Extract, Carya Ovata Bark Extract.